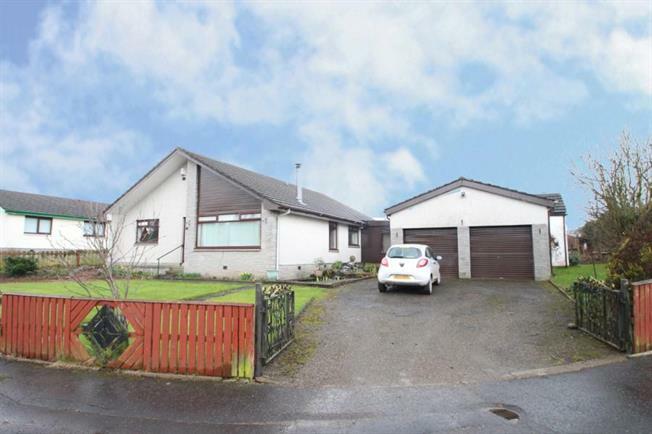 4 Bedroom Detached Bungalow For Sale in Biggar for Offers Over £210,000. Fabulous extended bungalow offering most substantial on the level accommodation. Offering a flexible layout of apartments extending to; entrance vestibule, reception hall, dual aspect lounge, dining room, fitted kitchen, sitting room, family room or 5th bedroom, utility room, shower room and conservatory. The bedroom wing of the property offers four generously sized bedrooms with the master bedroom benefitting from en-suite facilities while a bathroom comprising four piece suite completes this wonderful family home. The specification includes double glazing and gas central heating in addition to two multi fuel burners located within the lounge and family room. The property enjoys an expansive corner style plot offering an abundance of car parking facilities and privacy. The bungalow benefits from driveways to both the front and rear with further off street parking available within the integral double garage accessed via two remote control roller doors. Thankerton has long been popular with the discerning buyer and offers much in demand semi rural living. This property is of a size and style seldom available within the property market. The agents stress internal viewing essential to fully appreciate the size and flexibility of accommodation on offer.